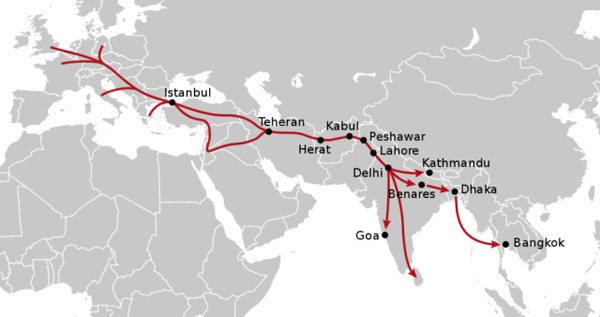 The classic Hippie trail was the overland route from Europe to Asia and it started with Istanbul (Turkey) and then followed Lebanon, Iran, Afghanistan, Pakistan (Chitral), India (Kashmir,Manali,Goa), Kathmandu (Nepal). See map. But there was also the route to Morocco, North Africa. The hippie subculture was originally a youth movement that arose in the United States during the mid-1960s and spread to other countries around the world. The etymology of the term 'hippie' is from hipster, and was initially used to describe beatniks who had moved into San Francisco's Haight-Ashbury district. Both the words "hip" and "hep" came from African American culture and denote "awareness". The early hippies inherited the countercultural values of the Beat Generation, created their own communities, listened to psychedelic rock, embraced the sexual revolution, and some used drugs such as cannabis, LSD and magic mushrooms to explore altered states of consciousness. Essaouira was discovered by the hippie movement in the late 1960's and early 1970's. Rock stars such as Jimmy Hendrix and Cat Stevens visited the town and the Living Theater of Julian Beck and Judith Malina found a home there for a time. Because of the presence of such celebrities, Essaouira became a destination for young people and artists who left an important mark on the cultural tourism that would develop later. The Living Theater, which combined elements of stage and visual arts, along with the psychedelic paintings with which hippies decorated the walls of their rooms, is thought to have inspired the first generation of Souiri painters: Boujemâa Lakhdar, Houssein Miloudi. It has also influenced the post-psychedelic Tribal or Gnaoua style typified by Mohamed Tabal and now closely associated with the culture of the city. Yet the hippie “boom” was short-lived and could not forestall the city's long decline.
" "I visited Essaouira in the late sixties and beginning of the 70's. Usually we came from Marrakech by bus and stayed some time before continuing the travel to the south to Mirleft, Tiznit. In Essaouira we rented a room in the Dar el Pacha hotel. A room only with a carpet of straw but where we could sleep 4 persons and cook our meals with coalfire. " "The Hippie Trail represented an alternative Silk Road on which, instead of silk and spices, freedom and love were the ultimate gains. It was a kind of pilgrimage for many Americans who felt suffocated by the growth of materialism. The trail was a search for oneself and spiritual enlightenment through using different types of drugs or exploring various forms of religion. An escape from the “evil West” into the “more humane” side of the world." "The hippies caught the last train to a world that nobody expected would one day cease to exist. They created a trail of which half is lost in history due to politics and terror. The Westerners who traveled the East during those two decades are considered pioneers of the spiritual journeys around the Indian subcontinent, Nepal, and Southeast Asia, but their style and naivety were unique."